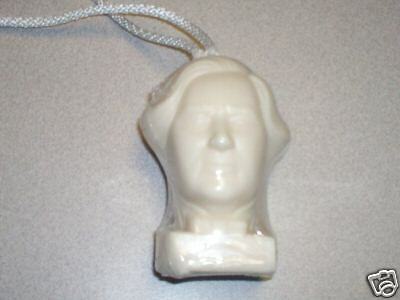 Our 13th President, Millard Fillmore, was the subject of a car commercial around President’s Day that featured a “soap-on-a-rope” likeness of him. Poor Millard isn’t recognized for very much, but at least he now stands on equal commercialized footing with Washington and Lincoln, at least for a few days. The A. Lincoln Blog on Tuesday noted that not only was it not just a prop, but there’s actually one for sale on eBay–and the price is up to $53.00! The article was about Fielding Hurst when he served as judge of Tennessee’s Twelfth Judicial Circuit during Reconstruction. I’ve been researching this period of his life, one that has largely been ignored by other Hurst researchers. I’ve defended him both on this blog and in my book Hurst’s Wurst: Colonel Fielding Hurst and the Sixth Tennessee Cavalry U.S.A., pointing out that many of the bad stories about him were partisan in nature, written by ex-Confederates with a bone to pick. The article was published in the Daily Memphis (TN) Avalanche on June 22, 1867 . Entitled “Radical Demonism,” it described how Judge Hurst interrupted a speech made in Purdy, Tennessee by Emerson Ethridge, former Congressman and gubernatorial opponent of Governor William G. Brownlow. Ethridge was a conservative Unionist who believed former Confederates should have their voting rights given back to them, rights taken away by Brownlow and his Radical supporters in the General Assembly two years earlier. Judge Hurst was a Radical and had voted for the suspension of ex-Confederates voting rights. Disliking what he heard while standing in the crowd, Hurst finally jumped onto the platform where Ethridge stood, “swinging his arms back and forth like the levers of a windmill,” and let out a torrent of obscenities at him. “That’s a d–d rebel lie, I’ll bet a thousand dollars,” Hurst reportedly cursed. “God d–m the rebels!” He pointed in his mouth and showed the bewildered Ethridge (who had no idea who he was) two missing teeth he claimed a rebel knocked out. He then cursed the Masonic Lodge and the church where the candidate’s speech was being given (despite himself being a Mason). The article was clearly biased toward the pro-Confederate Conservatives and against the Radicals, so it’s hard to determine its truthfulness. Still, it shows a darker side of Fielding Hurst, whom the article describes as “monarch to all he surveys” in McNairy County, “[n]arrow minded, of deficient education, without legal or other information, drunken and debauched.” It’s an interesting story. I wish I had uncovered it last year so it could’ve been part of my book. Today marks the 222nd birthday of Adam Huntsman, the man responsible for the legend of David Crockett at the Alamo. Had the peg-legged lawyer and politician from Jackson, Tennessee not defeated him for re-election to Congress in 1835, Crockett would have returned to Washington and missed the Battle of the Alamo and the legendary stature that he enjoys today. 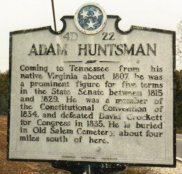 Huntsman was born today in Charlotte County, Virginia in 1786, six months and six days before his famous opponent. He lost his leg at some point during the War of 1812 and wore a wooden prosthesis the rest of his life. It added to his colorful character and emphasis to his speeches; while serving in Congress, he stomped it on the floor to make a point! “He was a man of great ability, fully equal to Crockett in native intellect, and much his superior in education and mental training,” recalled Peter H. Burnett, a Hardeman County, Tennesse resident and later the first governor of California. This will be the only football post I will ever write in my life. I’m not a football fan. I don’t live and die by a college or NFL team’s fortunes. The most exposure I get is from sports talk shows and the occasional segment of SportsCenter, which gives me enough idea what’s going on to talk with a friend who does live and breathe it. My sport of choice is baseball. Baseball is a game; football is war. Baseball is played in ballparks like Wrigley Field and Fenway Park; football is played in stadiums like Soldier Field and War Memorial Stadium. George Carlin describes the differences so much better and funnier. I wasn’t going to watch the game. Not even for the commercials. But my friend (who will remain nameless for obvious reasons) called me 30 minutes before the coin toss and said, “You have to watch it.” He is a Patriots fan who lives in Tennessee (go figure). Optimistic could not describe the confidence he held in his team; without a doubt, he knew they would win. There was no question. 42-10, he told me. “And I’m being generous giving them 10 points,” he added. He also knew the eventual MVP would be either Rodney Harrison or Randy Moss. “You should watch it,” he said again. So I did. I sat on my couch with a bag of Fritos and a can of Mountain Dew and I rooted for the Giants. 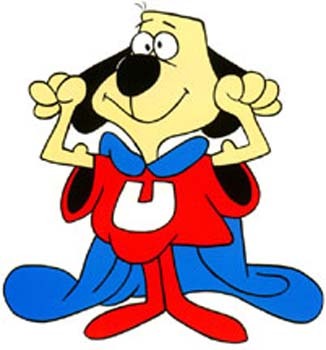 I’ve always like the underdog, no matter what sport or aspect of life. We all do. The media wrote off Eli Manning and company and prepared for The Perfect Season to be fulfilled. My loyalty wasn’t without doubt either. Though shaky in three or four games, the Patriots were a good team (my friend told me so) and would beat the Giants. Tom Brady may not have the best game, but watch for Harrison and Moss. 42-10, he said. During three-fourths of The Game, Brady was like groceries: sacked. I’ve never seen a quarterback with less protection from his defense than I did last night. But they did hold New York to a field goal for most of the game. It wasn’t until the fourth quarter that Brady eased into somewhat of a groove, snapped off a few throws, and got what looked to be a clincher touchdown with less than five minutes to play. But Eli, always known as Peyton’s kid brother, finally walked out from behind his shadow and into the spotlight and Super Bowl history. It was truly great to watch: three Patriot defenders had him sacked, but Lil’ E somehow managed to get out from under them and made an incredible throw for a first down. When they scored to make it 17-14 with under a minute to do, I knew it was over. What was to be a history-making Super Bowl actually was; for the Giants, not the Patriots. David triumphed over Goliath. The underdog won. I thought about calling my friend, but I guess it would’ve been cruel. 42-10 was not meant to be. I actually enjoyed the game and I cheered just as much as I did when the Cardinals won the World Series two years earlier. Wow, this is a new experience for me! Maybe I’ve found a football team to pull for. Imagine that: a Tennessee boy rooting for a New York team. Go figure. Fans of the Class D Kentucky-Illinois-Tennessee League (better known as the Kitty League), I need your memories! It’s been my goal for the last 10 years to write a comprehensive, season-by-season account of the league’s history. I still intended to do it, but I still have a lot of work and research to finish before it’s completed. In the meantime, I would like to begin work on what I call a “nostalgia” book about the Kitty League. It would be a book filled with pictures, memorabilia, and fan memories. If you lived in Fulton, Cairo, Jackson, Owensboro, Paducah, Union City, Mayfield, or Madisonville, do you remember what it was like to go to a game as a kid, sell tickets or work concessions, be a batboy, catch foul balls, or any other experiences at your local ballpark? If so, I’d love to hear from you! Who were your favorite players and managers? What do you recall about the ballparks themselves? Did any of them stay at your house? Any memories at all, I would like to include in this book. Send me an e-mail! 42%How Addicted to Blogging Are You? I saw this survey on Paul Taylor’s With Sword and Pen blog and thought I would see where I ranked. More time writing, less time blogging for me!